July 24, 2013, 1:39 p.m. Okay, so this isn’t actually a list. But a new tool is aiming to lower the barriers for community participation in blogging with a little help from BuzzFeed’s format. By Sarah Darville @sarahdarv July 24, 2013, 1:39 p.m. If WordPress, Google Docs, BuzzFeed, ScribbleLive, and Storify had a baby, it (a) still wouldn’t have gotten as much attention as the Royal Baby, but (b) might look something like NewsPad, a new collaborative blogging tool. NewsPad is a project of Nate Matias, whose work at the MIT Media Lab we’ve written about before, and Andrés Monroy-Hernandez of Microsoft Research. The goal is to make it easy for a group of people to work together to tell one story — whether that’s a local protest or a future-of-news conference. “Then you can further edit it — but often getting past the blank page is the most important thing,” Matias said. That’s likely to ring true for hyperlocal blogs that have found it difficult to meet their goals for significant community contribution, from The Local to InJersey. Structuring the article in that chunked, BuzzFeedy fashion was important to encourage participation, Matias said, since contributing text or a photo that is clearly only one part of the final product is less intimidating than taking on the responsibility of editing an entire post. “Even if you don’t see yourself as a writer, you can still take a tangible action and help as a member of the community,” he said. NewsPad grew out of an experience common to anyone who has tried to keep up with a big event or conference: There’s a hashtag to follow, someone’s usually liveblogging (“Where’s the link to the Google Doc?”), and people are posting pictures to their various social media accounts. Building all that into a common, sharable narrative is one of the goals here. Matias and Monroy-Hernandez have tested the platform a few times, including at last month’s MIT-Knight Civic Media Conference and during the recent Microsoft Design Expo. They also tried building a site called Garage Sale Stories that tried to get contributions from the people buying and selling their wares at a Seattle garage sale. Those are two ends of the spectrum for what the platform could be used for: On one hand, events where lots of people are interested in documenting something in real time; on the other, events where it would be nice to have after-the-fact documentation and involve a group of interested people in the process. Those two audiences interact with NewsPad differently. At the garage sale, researchers gave out postcards inviting people to submit content to us via email and social media. “We did not get as much input and responses right there when they were buying stuff, but when we went online, people were more amenable to sharing things when they were not busy with their shopping experience,” Monroy-Hernandez said. The researchers are now recruiting bloggers and hyperlocal journalists to try out a beta version of NewsPad, but they cautioned that it may not be released more broadly. There are some other kinks that might limit its appeal — it doesn’t have a drag-and-drop interface like Storify for embedding tweets and photos, and embedded posts generally won’t match the formatting of the rest of a blog. But Matias sees this as an experimental tool that local blogs might use to engage with readers in a more human way, especially as platforms like EveryBlock disappear and hyperlocal blogs face significant obstacles to success. “I’ve been trying to bring back the human touch into community storytelling,” he said. The tools that get added will depend in large part on the feedback from beta testers. The result doesn’t have to be fancy, as this recap of a conference session shows. In that case, NewsPad just helps multiple people edit the text simultaneously and then for the text to be published without reformatting a Google Doc. Though it can end up full of gifs, slides, links, and embedded tweets, too. POSTED July 24, 2013, 1:39 p.m.
Darville, Sarah. 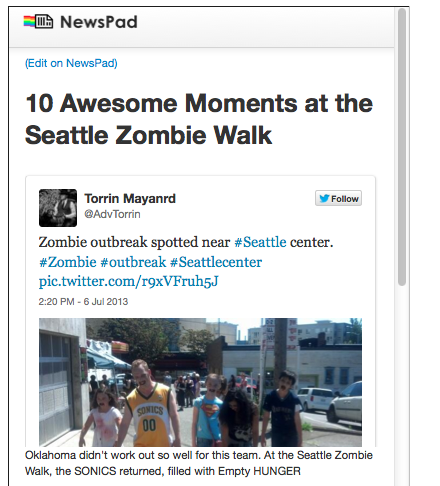 "5 things you might like about NewsPad (which made us write this headline this way)." Nieman Journalism Lab. Nieman Foundation for Journalism at Harvard, 24 Jul. 2013. Web. 20 Apr. 2019. Darville, Sarah. 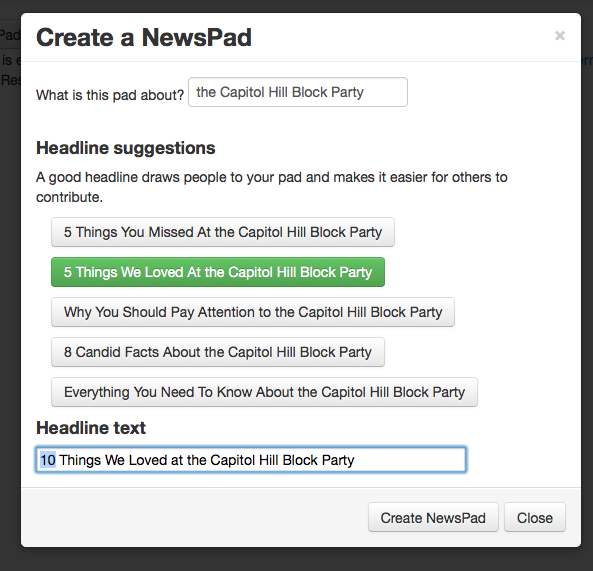 "5 things you might like about NewsPad (which made us write this headline this way)." Nieman Journalism Lab. Last modified July 24, 2013. Accessed April 20, 2019. https://www.niemanlab.org/2013/07/5-things-you-might-like-about-newspad-which-made-us-write-this-headline-this-way/.